Sein Wut Hmon Group is one of the leading conglomerate group in Myanmar. Our group diverse array holding ranges of business into distribution, manufacturing, plantation, service, retail and trading. 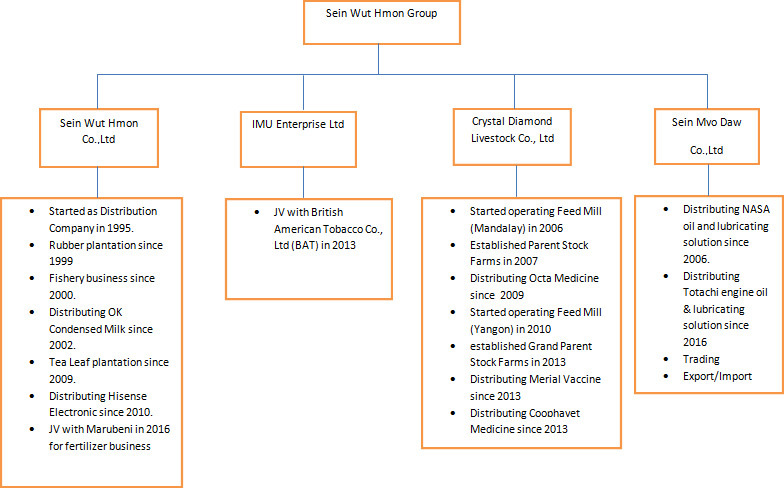 We are operating our business through Sein Wut Hmon Co., Ltd. (a distribution company), IMU Enterprise Ltd. (a manufacturing company), Crystal Diamond Livestock Co., Ltd. (Livestock and Feed manufacturing Company) , Sein Myo Daw Co., Ltd. (a trading company), and Star Way Co., Ltd. (a distributing company).